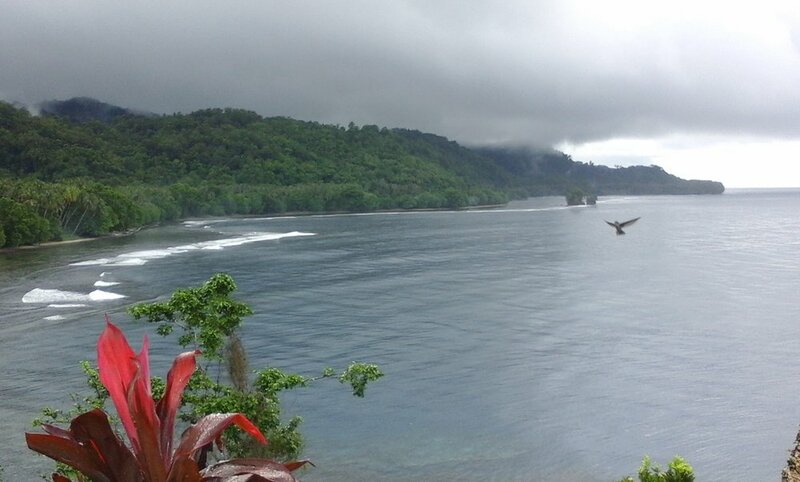 For the past six months I have been living with Shark Callers on the tropical island of New Ireland, five hundred miles east of mainland Papua New Guinea. My home in Tembin village rests on the volcanic shores of the Bismarck Sea, the site of Dennis O'Rourke's 1982 documentary, The Sharkcallers of Kontu. This anthropological classic discussed the struggles of local fishing culture against the modern threats of Christianity and capitalism. Decades later, the faces of Tembin have changed but the cultural connection to sharks is still woven into daily life. Many children from the film now have children of their own, filling the void left behind when its main character Selam Karasimbe passed away years ago. Selam is remembered in an old photograph taped to a cement gravestone, the elder sharkcaller standing arm in arm with O'Rourke. Today, in spite of the filmmaker's fears, middle-aged men in Tembin still catch large sharks by hand without the use of any line, net, or modern materials. My stay in New Ireland is part of a larger research project which questions how fishing communities in the Western Pacific imagine, explore, and claim parts of the ocean that are also valuable to extractive industry. With the world's first seabed mining project, Solwara 1, set to begin mining the deep Bismarck Sea in 2018, my research aims to provide a cultural baseline that can be reexamined during and after their project is complete. At least, that is part of it. In fact, there are so many more questions I have since being in the field. Some of these are my own, and some are shared among all of us: anthropologists, shark scientists, and local fisher-families. One of these questions is whether the sharks of the Bismarck Sea can be considered a shared stock with those in Indonesia and Australia. Already, several scientists from the Australian National research organization, CSIRO, are looking for answers. But while they conduct catch-per-unit-effort analyses, genetic research, and market surveys, the shark callers of Tembin have their own answers. "The shark," an old man told me, "he goes everywhere he wants. He wants to go to Australia? There are no roads in the sea...he just swims over there. He doesn't need a passport!" When considering the duration and intimacy of knowledge these fishermen have with sharks, this type of statement should not be discarded as mere folklore. Several days a month, when the wind and seas are just right, the garden food happily planted, and myriad other social obligations tended to, the shark callers of New Ireland paddle out from shore in their wooden dugout canoes. Leaving early in the morning, they will be many miles out to sea by noon. There, in the crystal blue water, they will begin their long practice of calling the shark. Singing softly, they shake a coconut rattle against the submerged part of their canoe, sending unique and personal rhythms into the deep sea. They might do this all day long and return home with nothing. Or, if the shark hears them and senses them to be "clean," the shark caller may return to the beach with a meal for his entire clan. In these stalwart expeditions to the open sea, the sharkcaller has the opportunity to observe shark behavior from mere feet away. He knows how they swim, knows how they eat, knows exactly what makes the difference between them taking the bait or swimming away. Having seen many of them alive and some of them dead, the shark callers know far more than commercial fishermen about shark speciation, anatomy, and physiology, even gestation and birth. Each and every part of the animal, from the "wing" to the liver, has a name in the Mandak language which dates back untold hundreds of years. "The shark-caller," as my old friend often says, "He knows too." The villagers of New Ireland are among the friendliest and peaceful people in the world. They encourage more visitors and scientists to come stay with them, learn to paddle the canoe, dive along their pristine reefs, and talk until late night about sharks. Guests to the island have many options for lodging, from upscale Nusa Island Retreat and Lissenung Island to traditional homestays. For any trip, I suggest a mix of both. Pack light, with an extra checked bag for much-needed school supplies and gifts for your hosts. And remember to pay your respects to the shark temple before stepping into that wobbly canoe.